Most homeowners can relate to the feeling of dread that comes over your entire body when you think about cleaning your stove top. If you have recently purchased a black stove top oven and are wondering how to clean black stove top without scratching, well, you are not alone! This article will give you all the little tips and tricks you need to clean it the easiest way possible. 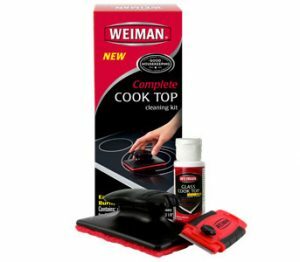 You can read all about homemade solutions, as well as special cleaning products, such as the Weiman Complete Cook Top Cleaning Kit, you can get from Amazon today! 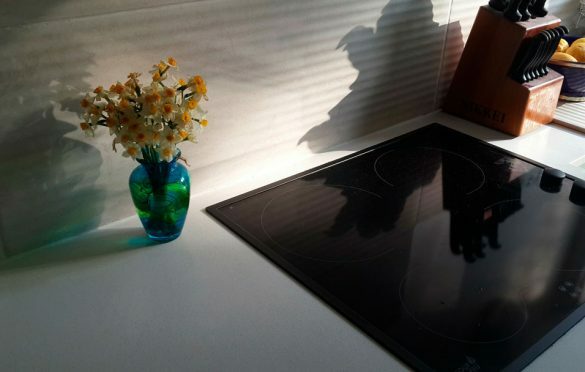 A black glass stove top can be quite sensitive to harsh cleaning liquids or even scrubbers and brushes. A gentle yet effective cleaning solution can be made at home to clean your black stove top without creating a laceration to the stove top. Mix ½ a cup of white vinegar with 1/4th of a cup of baking soda in a gallon of water. Mix it until you form a paste. Apply this paste on the stained areas of the stove top, or apply it evenly all over the surface. Use a soft, microfiber cloth to gently scrub off and remove all stains, dirt, grease, and marks off the black stove top. This will ensure that you leave no scratch marks on the stove top glass. Some stains might be more stubborn and require a little bit of scrubbing. But scrubbing gentle enough to avoid damaging the gorgeous black stove top. For more stubborn stains, you can mix some cleaning detergent and warm water, and add a few drops of lemon to it. The lemon cuts out the stains while also giving the stove top a clean, citrus aroma. You can also mix a little bit of baking soda, but this is completely optional. Mix the ingredients well and apply this mixture on top of the problem areas on your stove, or all over the surface. The warm water will help loosen up any stubborn particles and make it easier to clean. Take a soft cloth or a very soft bristled brush and scrub it gently so as to not create any scratch marks on the stove top. Finally, wipe the surface dry with a soft, microfiber cloth and keep your ceramic black stovetop clean! There is some old, crusty debris which is simply dried and stuck on too hard for soap and water to be able to remove them. In these cases, oil might be your best friend for removing these residues. Take a spoonful of any oil of your choice; it could be olive oil or any vegetable oil. Pour some oil over the stubborn residue on your porcelain black stove top and let it sit for just a few minutes. Now, taking a soft cloth or a sponge, scrub away gently at the tough stains and hardened residue. The oil should help loosen up any stubborn, hard residue and it should be easier for you to remove them off the top of your stove top. There are also certain kinds of oven scrapers available. Hold them gently at an angle and scrape away at the hardened residue. However, it is important to be very careful while doing this so that you do not cause any scratching. Sometimes the oils can help repair any tiny scratches on the glass of the stove top. While these home remedies might work quite well on most stains and residue, and even help you clean and maintain your black stove top oven regularly, some stains can be a little harder to clean out. And if you are very persistent with your efforts you can scratch the stove top. However, using harsh, abrasive products will only cause scratches on your black stove top. So you need a product that is strong enough to remove any stain from the black stove top and yet gentle enough to avoid scratching it. These are our top pick of oven cleaners which will help you keep your black stove top clean and scratch free. If you are looking for a special kit that is designed to clean your black glass stove top this is the product for you! It contains the special cleaning formula, a microfiber cloth and a scraper that will help you remove even the most stubborn stains. The blade in the set is perfect for removing burnt on grease from the stove top. If you do it at a good angle it will remove the stains with ease and without causing a laceration. An ideal, kit that has everything. Your black glass cooktop will be clean and shiny just like the day you bought it. Click here to check the current price on Amazon. A gentle, yet powerful oven cleaner, Break Up literally breaks up all particles and residue of dirt and grime, keeping your oven clean and hygienic. You can use it on the inside of the oven as well. Just spray it and let it sit for a few minutes. Afterward, wipe it down with a clean microfiber towel and enjoy your clean and scratch-free black stove top. The product, however, does smell a bit harsh. However, it is recommended to use the product with a protective mask and gloves. 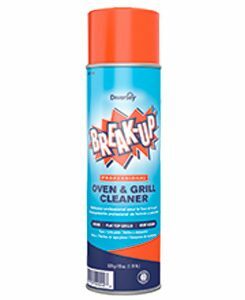 An extremely potent product for removing all kinds of grease and stains from your oven, Break Up is a great option for homeowners who wish to clean their ovens effectively. Click here to check the current price on Amazon. 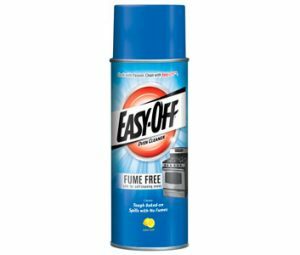 Looking for a no-fume, non-toxic oven cleaning formula which is safe to use in your kitchen regularly? Easy Off is the product for you! It will clean the stove top without scratching the enamel/porcelain. No scrub formula; simply rinse it out! The spray nozzle does not work as well after a few sprays, however, this is only a minor manufacturing error. If you tilt the can to spray, the spray nozzle works completely fine. An ideal, fume-free oven cleaning formula which is safe to use in all households. Click here to check the current price on Amazon. 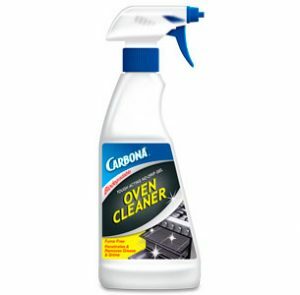 For those customers looking for a more eco-friendly, biodegradable oven cleaning formula, Carbona is the perfect solution for you. It will remove any baked-on grease on your stove without scratching it. Unfortunately, it can only be shipped inside the U.S.
For those homeowners who are afraid to use harsh, chemical-laden oven cleaners at home due to the toxic fumes, Carbona is the ideal product for you. Click here to check the current price on Amazon. If you have any tips on how to clean black stove top without scratching it, share it with us in the comment section below. Read also: How to clean burnt calphalon pans.